The fourth monitoring report of 'Iraqi Media House' [IMH]' is trying to show an initial perceptions about the media machinery of the organize that known as "ISIS," or "The Islamic State", through an approximate count for its platforms, and various interfaces; Also by inspecting its contents, and the machinery of their display and promotion; In addition to finding out the ways that the armed extremist organization handle to evade censorship and closure procedures that are carried out by the World Wide Web companies in the world. This monitoring includes a survey of the media language used in these platforms, methods of design, and related forms of presentation, as well as its contents, also chasing the visual materials outlets of the organize, which are classified as basic pillar in its media products. 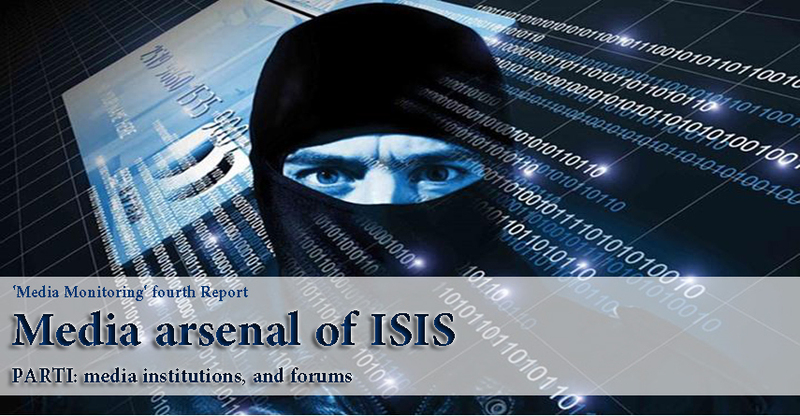 The report has monitored also the websites that do not follow 'ISIS', but deal in different ways with the its activities on the ground, as well as the extent of communication and interaction with the 'Jihadists' audience, as this acquires an importance related with the mechanisms of the expansion of the organization and its attempts of expansion among population by the use of modern tools and techniques. First part will be dedicated for websites, forums, and productive institutions, while the second part, which will be published in the coming days is dedicated for social networks and the ways of news publication through them, and the final part will inspect global websites which are used by the organize to promote its publications; The report will also contain general observations about the overall report. This arsenal provides services in several languages in addition to Arabic, such as English, French, Turkish, Kurdish, as well as Chechen language; It also owns magazines, editions, and local radio broadcast, notably "Al-Bayan" in the city of Mosul (northern Iraq), in addition to cabins that called 'informative points' through which displays its films and data, directly to the public. Second: media arsenal of ISIS includes a huge library specialized in providing the support that its members need, of Tec. resources, speeches, reports, all means of recruiting, financing, training and stealthy tactics, combat-making explosives, and all necessaries for "jihadists" in the confrontation operations within guerrilla warfare and the attrition warfare. Third: Inability to get an accurate statistic of the organization's media machinery on the web, because it is always under monitoring and shutdown by the "international coalition" and in coordination with global companies such as "Google", "YouTube", "Twitter", "Facebook", and others, as It is been noticed, for example but not limited the disappearance of video clips for executions applied by ISIS, minutes after being broadcasted on "YouTube". Fourth, In addition to the declared websites for ISIS, there are website which either chock, or pro, or sympathetic, or competent to publish all the news and products of jihadist factions in the world, without exception [we will refer to them in detail through this part]. Fifth: There are no constant websites for media institutions affiliated to ISIS organize, due to the continued closure, therefore it is facing a propaganda war in remaking new web links for its institutions, where dozens websites of blogs and forums are being produced daily. Sixth: Remarkably, the majority of ISIS websites have sub accounts in all its social networking programs, as basic forums have sub links and accounts on social networks and YouTube, in order to deliver their messages in more widespread manner, while it's difficult to be closed them all. Seventh: Those websites do not provide only informative service to the organization, but they provide means of communication between the organize members who are deployed on a large geographical area and might be difficult to communicate via phones or e-mail, while some of the leading websites allow limited access for specific members after confirming their identities by the administration, and those websites use sophisticated blocking software that prevent geographical locations identification, as well as they provide the subscribers a free 'IP blocker' service; and they focus on advising the new subscribers about such protection , in addition to tips to prevent identification of the geographic scope of the joints through their publications' analysing, and exhort subscribers to change their pseudonyms continuously. Eighth: Some websites of ISIS, especially the main and leading ones, do not allow ordinary guests to access their contents, [or some of their contents], as the visitors of such forums need to register via email address, to ensure their interest and sympathy for the organization, then they would be allowed to access publications. Ninth: The display language of topics in those websites characterized in rhetoric and grammatically strong language, and the majority of those sites are well designed. Tenth: "jihadi" websites do not impose any restrictions on publication of ISIS's dead photographs, or its materials loss, where they often focus on them and publish video clips in which their gunmen appear in last moments before death; they also show what incurred during the battles in a way that targets propitiation, or rally ISIS supporters, or people in its controlled areas. He adds, "Supervisors of the media who work for 'ISIS', are mostly Salafi Saudis because of their eloquent language, and their opulent elocution with heavy legitimate inference to prove loyalty to 'Abu Bakr al-Baghdadi’. The blog pays attention to the civilian casualties because of military operations against the organization in order to gain the trust of the local population; it also characterized by an interactive manner to large extent that allows publics to comment and give opinion; additionally it includes specific tabulations for Islamic law contain Quranic verses and hadith. ‘almourasiloun’ network: This blog is characterized by a stunning and attractive design; it includes tabulate for the organize combat activities in the Caucasus, Asia, and Africa, and publish daily detailed news reports on ISIS combat, with an entire archive, in addition to audio and video productions of enthusiastic songs; it also publishes opinion articles supporting ISIS, and provides educational programs for computer protection, web design, and Photoshop techniques. ‘minbar-alansar’: Another subsidiary blog of ISIS that publishes its combat activities in all states and territories; Its main content based on the written responses of audiences in form of articles or brief Comments propped with evidences from Quranic verses and sayings of the Prophet to address the Muslim clergy who attack ISIS. On the home page of the blog, there are five basic themes, each of which is broadcasted within a square window web which contains an attractive high-resolution image. The blog allows its members to comment on the articles, and promotes the visual media organizations affiliated to the ISIS, such as institutions of [Al:Battar, Furqan, Al:Hayat]. It owns accounts in social networks [Facebook and Twitter]; the site provides services of contact management, commenting, viewers counter, and religious legitimacy studies. ‘daawla’: This blog belongs to 'Battar’ media institution affiliates to ISIS; its contents are similar to its name, consist of various publications about ISIS, like data, news, photos, and video clips, and it focuses on deploying websites, forums, and account addresses on social networks that are pro-regulation, more than focusing on interactive with audience. ‘Akhbar dawlat alislam’: The Blog publishes the activities of the organization, and promote for some of its pro media institutions, especially the [Furqan, Eitisam, Hayat, Battar]; also it publishes videos issued by these institutions and provided with English and French; the blog does not allow interaction by public through comments or expressing opinions, while accept news delivery via e-mail service after registration in the site. ‘Al-dawla-ba9iya’: a well-designed blog, with ISIS flag background; it publishes the most prominent videos of the organize, such as executing prisoners of war and the battles all around cities; it provides also news service, and publish statements, in addition to tabulates for call for jihad and the legitimacy awareness; This blog devotes a window web for publishing the explicit names of the dead, or suiciders after their mission. Additionally it focuses on requesting members email addresses in order to provide them with latest threads and news of ISIS. It's difficult to prosecute forums because it is a free service, unlike regular Websites that require fees for Internet companies in order to reserve a certain space in cyberspace then can be traced and closed easily. This forum contains fixed sections for teaching hacking and web design, in addition to teaching bombing, security processes, military contexts, and it has an entire archive that presents the most important topics in big images at the home page of the forum. ‘Alfetn’ Forum: it does not belong to ISIS organize and present itself as ‘neutral’ in topics dealing with ISIS in criticism or support; it publishes all jihadist factions' activities in any region in the world, and allows the public to comment but after official registration by personal email, debates should be quiet without cursing and insulting. Additionally, it does not allow full access to its sections without prior registration. The Forum gives ISIS the name 'Islamic state’; Also it's been noticed that does not include extremist descriptions that are used by jihadist factions. ‘The sham news’: A Website which defines itself as ‘not belonging to ISIS organize, or any jihadi faction’, but the majority of its themes promotes for ISIS like data, versions of visual and imaging publications, and news; on the other hand it publishes articles that criticize some of ISIS actions by clergy or ordinary people as includes opinion articles against ISIS critics. ‘AlNusra’ forum: it does not follow any jihadist faction but publishes news and all versions of these factions, including ISIS; it was shut few weeks ago, now its activities limited to social networks [Facebook and Twitter]. Access to forum services requires registration via e-mail. Hanein Network: This Forum is one of the oldest and largest forums dealing with news of jihadist factions without exception, it identifies itself as a network based on ‘disseminating and processing news through dialogue in order to facilitate understanding and trading the news properly’, and as stated at the forum, it is [neutral and not belonging to any province or nationality or country or organize], but there are information indicating subservience to ‘Al rashideen Army' [Iraqi faction]; it Includes special data tabulates for jihadist factions, including ISIS, as well as video and audio versions for them, also includes debates between supporters of jihadist factions without bias by the forum Management or intervene on behalf of a particular faction; the forum includes an English section. Visitors are not allowed to browse its contents unless they are registered by e-mail, as noted in the forum interface in an administrative message assures registration condition before accessing contents. ‘Dawa alhaq’: It is a news agency as known in media conventional sense, it defines itself as 'a professional news service, not affiliated with any faction or organization, belongs to 'call of right for Studies and Research' [a think tank concerned with the issues of the Islamic world]; It is Observed in the Forum an acquisition of ISIS's news to the majority of its articles which includes its activities, images, and video clips; the language used in the formulation of the news is the same language used by jihadist militant groups, such as describing Shiites as 'Ruad', and some Sunnis 'Apostates', and others; the Forum devoted one its sections to teach how to formulate the news dealing with jihadist factions, and formulate news of a video clip belongs to jihadist organization, and it allows the public to comment on all publications. ‘Aa3maqnews’: This news agency belongs to ISIS organize, it refers to itself as 'unofficial agency'; its design is very poor and limited in daily news publishing, even it does not apply updates on its subjects. Mr Hassan Abu Haniya [a Researcher in Al Jazeera Centre for Studies, said : 'the tapes and promotional material issued by media organizations for production, affiliated to the organize, refers to the significant shift in its structure, high capabilities, violent tactics, and its horrific combat strategy, as it issued series of neat movies, most notably the series [saleel al sawarim, breaking Boundaries, sermon of Baghdadi , behind them, in addition to 'the flames of war' which is the greatest media production]. The majority of media production organizations have no fixed websites due to the continued closure by Web companies, therefore they do not rely on their web location in the deployment of their productions, but depend on hundreds of websites, forums and blogs affiliated, advocator, pro and sympathetic, as well as thousands of accounts on social networking websites, especially Twitter and Facebook. These institutions always establish their own channels on the "YouTube", but they are frequently subject to shutdown. Institution of ‘Furqan’ for Media Production: It is considered as the main arm of ISIS organize [the expert on jihadi factions' Affairs 'Hisham al-Hashemi' said], and he asserts that the Saudi 'Nasser Al-Ghamdi' is currently overseeing its work from Syria after the dismantling of its headquarters in Iraq in 2010"; the institution is characterized in producing its versions [overall documentaries] with high technical quality; the leading versions of this institution [a nation of welfare, Saleel Al Sawarem [four parts], guidance and glad tidings for the believers, crown of dignity, martyrs' caravans [two parts], the state of Islam will remain, Battle of revenge for our prisoners in Fallujah, the battle of Abu Hafs al-Mashhadani, Invasion for Rubaie bin Amer, Battle of [free Al-Ani], Knights of Shahada [five parts], Harvest of the defeated in Mesopotamia]; it currently has no website. 'I3tisam’ is using social networks to promote its production; It has many visual versions, notably [windows from land of epics, life series [documentary], behind them, even if unbelievers hate, pride of parents, who let them down had no harm to them]. Jihadist informative platform [UCUdTO89no_ibjt_eT7XdRxw]: A Channel on YouTube that includes full media service for ISIS versions produced by all other media organizations. ‘Ghurabaa’ Foundation [UCO2TnC8D2frsBpZclNqLaRw]: an ISIS subsidiary Channel on YouTube, does not have a website. ‘Alsaqeel’ Foundation: a Channel on youtube which identifies itself as 'media organization concerned with Islamic affairs, publishes facts of the ground, and retrieve Islamic history'; It publishes media versions [Audio & visual] of ISIS, and doesn't have website or forum but has several accounts on Twitter. ‘AlDawla’ versions [UCioaG4gsDQ4hIgFCJiVkrXA]: Is one of the largest and most active channels on YouTube, that officially belongs to ISIS, includes a complete library of all the organize media versions; it obtains a large rate of viewers, and the Comments on its video clips looks like heated debates between supporters and opponents of the ISIS. This institution is concerned with the work of the immediate videos on the military operations of ISIS, it relies on adding technical effects with high audio quality; it is always under prosecution, and often it creates a new account after the old one is being closed; It is unknown who stand behind that institution. ‘Tripoli Sham’ [UCJCodnYt1Atv8QJeQZI1fqw]: a channel on YouTube publishes audio and visual versions of ISIS. ‘Bara’ Foundation [UCuz3PGp3VHK09jaCpLAWJBg]: a channel on YouTube, and counted also as media institution but with limited productions, it focuses on deployment of other large media organizations, such as [Furqan and I3tisam]. It relies in work on European and American experts; and prominent releases of 'Al Hayat': [Letter to America ‘which included the slaughter of an American hostage', a visit to Mosul, flames of war]. Among the most prominent publications in the DAbuq the dialogue translated into English with the Jordanian pilot 'Muath Kasasbeh' before his execution by burning, additionally there are published topics that justify captivity of azidi women. It includes topics specified in women's duties according the legal doctrine [Sharia], also it presents interviews with wives of ISIS members.